Got myself a nasty little spring cold, but that's not enough to stop me from trying these amazing Alfajores cookies. I mean really - cognac, lemon zest, dulce de leche and coconut? A litle Hennesey will surely help with the congestion, and what sick girl doesn't feel better with a plate of cookies? I am a woman of appetite. Said to be traditional tea time or snack cookies, these have a wonderful, somewhat biscuit like texture that I love, and despite the ultra-rich dulce de leche filling, the cookies themselves are not over the top sweet. There are recipes for dulce de leche from scratch, but I used the quick version in which sweetened condensed milk is simply baked until golden brown. If you want a special cookie, with a unique South American flavor, I highly recommend you try these little gems of goodness. 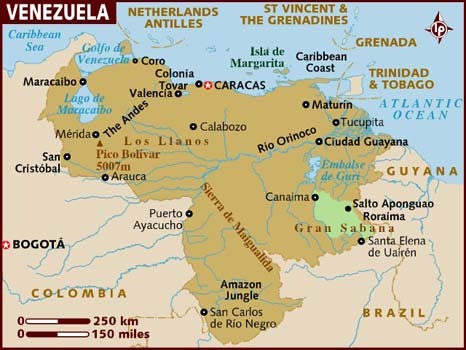 Located on the northern coast of South America, Venezuela (Bolivian Republic of Venezuela), borders Columbia, Guyana and Brazil. This beautiful country's biodiversity includes habitats that range from the Andes Mountains, the Amazon Basin Rainforest, Llanos Plains and the sparkling Caribbean coast, to the Orinoco River delta in the east. Animal life includes manatees, Amazon River dolphins and crocodiles (to name but a few), as well as at least 1,417 bird species. Literally thousands of fungi and plant varieties grow wild in Venezuela, as well as at least 25,000 varieties of orchids. One the world's largest exporters of oil and oil reserves, Venezuela's economy has recovered from difficult years spent laboring under dictatorships, economic crisis and attempted coups to become a significant player in the global economy. Cuisine in Venezuela varies greatly by region, but is influenced by indigenous and European influences, as well as by African and Native American traditions. Corn, rice, plantains, beans, potatoes, tomatoes, onions, eggplant, squash, beef and chicken are all staple foods enjoyed in this country. Cream the butter and sugar together, then mix in the remaining ingredients except the dulce de leche and coconut until well blended. Knead on a floured work surface until the dough is smooth and let rest for 15 minutes. Roll the dough out to a thickness of about 1/4 inch and cut into 2-inch rounds. Place on a greased cookie sheet and bake in a preheated 300°F oven for 20 minutes. When cool, spread some dulce de leche on the bottom of half the cookies and press another cookie on top, allowing some of the dulce de leche to squeeze from the sides. Roll the sides in the coconut until the sides are covered. Pour 1 can sweetened condensed milk into 9-inch pie plate. Cover with aluminum foil. Place the pie plate in a in larger shallow pan filled with hot water. Do not allow the water to cover the smaller pan. Bake at 425 degrees F for 1 hour or until thick and caramel-colored. This time I did have my dinner before I had a look at your blog! OMGosh! They look sooo delicious! The most idiotic thing here; don't seem to get cognac!Do you believe whisky can be used instead? Hi Astrid!! What? No wiskey on Mauritius?! How can this be? I think you could just about any liquor you like. Rum would be good, but so might Cointreau...experiment and let me know what you come up with. Hope all is well with you. Hugs! Anyhooo... was thinking macarons, but yours look much better :) yum!